I’m popping in today to share a sympathy card that is inspired by this one that I shared not too long ago. 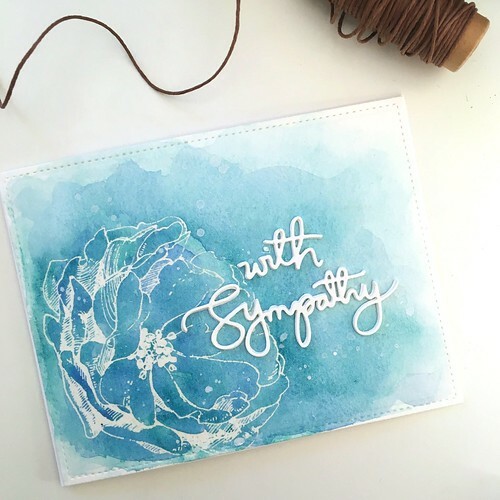 I simply stamped and heat-embossed an Antique Rose with white embossing powder then painted a wash all over (deepening the color in some places) on some Canson watercolor paper (affiliate link). After painting on several layers of a blue and green wash, I added some paint splatters with watered down white acrylic paint. The splatters don’t show up too well here, but it created a nice soft effect. 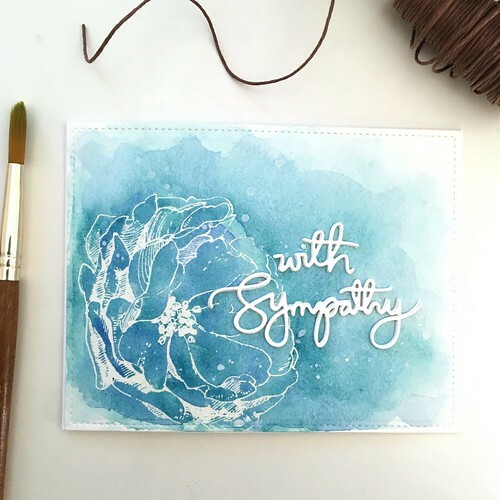 The sentiment was created by stacking several with sympathy die cuts on top of each other. I used multi medium matte for all of this, and used the same glue to adhere the finished sentiment to the right side of the panel. Love your cards! Do you sell retail? Hi Donna, thanks so much! I have an Etsy shop (https://www.etsy.com/shop/FreshwaterStudioShop) but I also do custom orders and have sold a few things in local shops.